I was lucky enough to be on a Mersey ferry just as the Bauhinia was being guided out of the River Mersey. As I mentioned the other day she’s the biggest ship seen in the Mersey and she was in the river at the same time as HMS Ark Royal. Although the ship looks big in the photo, only seeing for real do you appreciate just how big the ship actually is. How much steel went into constructing the ship and moreso how much did it all cost? 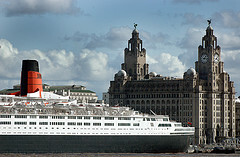 The BBC reports that the biggest ever ship to enter the Port of Liverpool is due to berth later today. The Bauhinia, which weighs 158,000 gross tonnes, will berth in Tranmere Oil Terminal at 1500 GMT, carrying a cargo of crude oil from West Africa. The vessel is 8,000 tonnes heavier than previous record holder, the Nisa, which berthed into the River Mersey in 1988. Apparently the ship is not fully loaded because that would make it’s draught too deep for sailing up the Mersey. The Telegraph reports that the QE2 arrived at her new home in Dubai the other night, exactly 40 years to the day after she first set sail. Recently seen in the River Mersey (photo credit), the famous liner is to be converted into a luxury hotel after being purchased for $100million by the Dubai state-run Nakheel company. 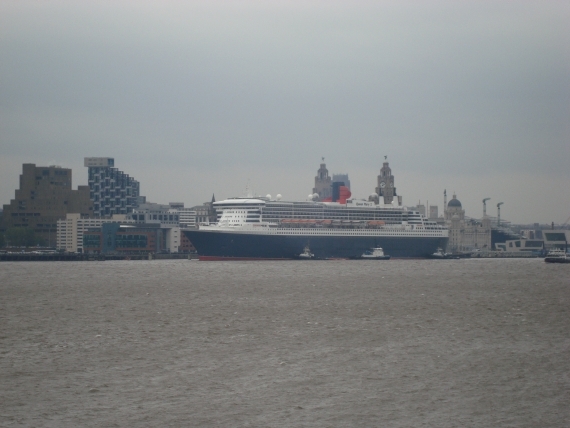 Doesn’t she look huge in this photo berthing next to the Liver Building?